How many times have you been looking for just the right gift, but didn't want to go all over town or search every corner of the web to find what you're looking for? Search no more!! Kiss My Style is your one-stop shop for so many cute gifts! Looking for bath products? How about Hawaiian Wedding Cake Whipped Cream Soap... Or what about a cute set of Black and White Ceramic Shakers. Don't forget that the Holidays are all too quickly approaching, wouldn't a cute Compact Mirror make the perfect stocking stuffer? 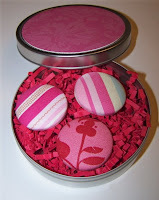 Be sure to check out all the fantastic products at Kiss My Style - and while you're at it, why don't you take a moment and enter to win the gorgeous pink magnet set from Kiss My Style. Just visit our Contest Page for instructions on how to enter! We're giving it away on Monday, so don't miss out - enter today!